Harry Potter and the Order of the Phoenix, J.K. Rowling, Scholastic, 2004 (c2003), ISBN 9780439358071, 870pp. I love the Harry Potter books. I also love A.S. Byatt’s Possession. And so I have avoided reading Ms. Byatt’s diatribe against J.K. Rowling and adults who read the Harry Potter books, although I have an inkling of what it might be about, and that did somewhat color my reading of this latest book. What Rowling accomplishes in the Harry Potter books is something that most writers envy, and that is the ability to get the reader so wrapped up in the characters and the plot that the only thing the reader wants to do is turn the next page. If, at this point in the series, the fascination with these characters resembles soap opera obsession, where minutia of each character’s interaction with the others is examined ad nauseum, we shouldn’t be so surprised. Television has changed how we read, for good or bad, and the regular installments of the Potter series has engendered a similarity to the scion of “Who Shot J.R.?” (in this book, the question that was an early prompt for readers was, “Who dies?”). If we forgive Rowling for simply writing books that fit the times, then we should ask ourselves, is it any good? And Rowling is very good at what she does. Is it the same as books written fifty years ago? No, not really. Rowling may, however, be harkening back more than a hundred-and-fifty years, to the installment writing style of Dickens (whose near final installment of his novel The Old Curiousity Shop was greeted as it arrived by steamship into the New York harbor by a cry of “Does Little Nell die?”). Harry Potter and the Order of the Phoenix isn’t perfect. As each successive book has increased in size and scope, Rowling has more and more trouble keeping the same smooth flow that characterized the first couple of books. While the focus never truly strays from Potter in any of the books, the slow accumulation of characters means that Potter’s necessary interactions increase exponentially. 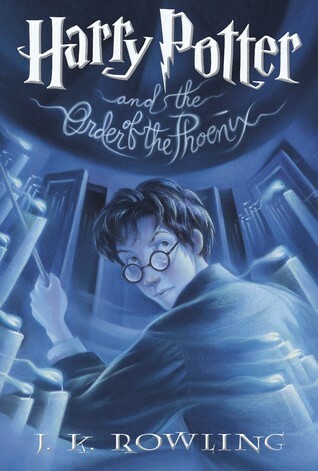 So, in this book, we get to see what’s become of Prof. Lockhart, the ongoing Percy Weasley vs. his family thread, more revelations for Hagrid, Neville Longbottom, and Snape, etc. Each character demands his or her ten pages and if that means that a 300 page book bloats up to nearly 900, the fans aren’t complaining because they find these side trips as fascinating as the main road. As a complete work, the Potter series will not rival the structural beauty of something like Lord of the Rings or even C.S. Lewis’ “Narnia” books. Tolkien didn’t release his work an installment at a time, and while Lewis did publish on the installment plan, he didn’t continue the same characters between the books. But just because Rowling isn’t like these previous authors doesn’t mean that her work is less good, or that it will be forgotten in fifty years. I reserve judgment on that until I’ve read the end, which is now only two books away.